The biggest issue of all perhaps is the twisting of the phrase "this generation." When Jesus spoke this parable, the words "this generation" could only refer to his first century audience standing there  before him, listening to his words. If you doubt that, notice how he uses the same phrase earlier pronouncing a curse to fall on the Jews of "this generation" (Mt 23:36) for their murdering of the prophets. Obviously, that judgment did not wait 2000 years or the Jews it was slated for would have all died before they were judged. To take Jesus' words "this generation" to mean "that generation" requires a complete disregard for the meaning of the word "this." It breaks Scripture, or denies its plain literal meaning which is not how Jesus taught by example to handle Scripture (John 10:35). If you have heard people talking about "the last generation"  this is where it comes from. There is no "last generation" in the Bible; Jesus always refers to "this generation" whether it was Moses or Jesus addressing a crowd who were about to be cursed. My point in showing you this is that Jesus' usage of the phrase in reference to events happening on his generation is consistently awkward, at least as in how it has been transmitted down to us in its final Greek. Perhaps the original Hebrew phrase Jesus  used for "all these things" was meant emphatically and not to denote completion. Maybe the Greek translator misunderstood and failed us all in his translation. Whatever the answer is, it's obvious from his usage that it's not best to take "all these things" to mean "every single thing I have been talking about so far." 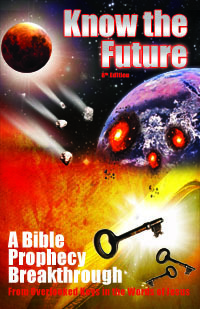 If you want to know everything I have to share on Wormwood and how God plans to save us right here on the earth from it, check out my comprehensive end time prophecy book Know the Future .